San Piedro Island, north of Puget Sound, is a place so isolated that no one who lives there can afford to make enemies. But in 1954 a local fisherman is found suspiciously drowned, and a Japanese American named Kabuo Miyamoto is charged with his murder. In the course of the ensuing trial, it becomes clear that what is at stake is more than a man's guilt. For on San Pedro, memory grows as thickly as cedar trees and the fields of ripe strawberries--memories of a charmed love affair between a white boy and the Japanese girl who grew up to become Kabuo's wife; memories of land desired, paid for, and lost. Above all, San Piedro is haunted by the memory of what happened to its Japanese residents during World War II, when an entire community was sent into exile while its neighbors watched. 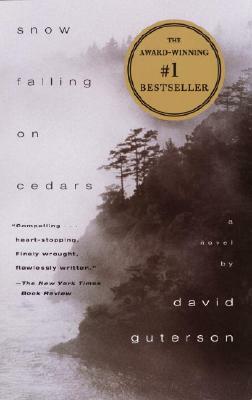 Gripping, tragic, and densely atmospheric, Snow Falling on Cedars is a masterpiece of suspense-- one that leaves us shaken and changed. David Guterson is the author of the novels East of the Mountains, Our Lady of the Forest, The Other, Ed King, and Snow Falling on Cedars, which won the PEN/Faulkner Award; a story collection, The Country Ahead of Us, the Country Behind; and Family Matters: Why Homeschooling Makes Sense. He has three forthcoming books: a memoir, Descent, from Vintage in 2013; a new story collection, Problems with People, from Knopf in 2014; and a book of poems, Songs for a Summons, from Lost Horse Press in 2014. He lives in Washington State.